Fossil finds in China are challenging ideas about the evolution of modern humans and our closest relatives. The reconstructed skull of Peking Man, the fossil that launched discussions of human origins in China. On the outskirts of Beijing, a small limestone mountain named Dragon Bone Hill rises above the surrounding sprawl. Along the northern side, a path leads up to some fenced-off caves that draw 150,000 visitors each year, from schoolchildren to grey-haired pensioners. It was here, in 1929, that researchers discovered a nearly complete ancient skull that they determined was roughly half a million years old. Dubbed Peking Man, it was among the earliest human remains ever uncovered, and it helped to convince many researchers that humanity first evolved in Asia. Since then, the central importance of Peking Man has faded. Although modern dating methods put the fossil even earlier — at up to 780,000 years old — the specimen has been eclipsed by discoveries in Africa that have yielded much older remains of ancient human relatives. Such finds have cemented Africa’s status as the cradle of humanity — the place from which modern humans and their predecessors spread around the globe — and relegated Asia to a kind of evolutionary cul-de-sac. But the tale of Peking Man has haunted generations of Chinese researchers, who have struggled to understand its relationship to modern humans. “It’s a story without an ending,” says Wu Xinzhi, a palaeontologist at the Chinese Academy of Sciences’ Institute of Vertebrate Paleontology and Paleoanthropology (IVPP) in Beijing. They wonder whether the descendants of Peking Man and fellow members of the species Homo erectus died out or evolved into a more modern species, and whether they contributed to the gene pool of China today. Keen to get to the bottom of its people’s ancestry, China has in the past decade stepped up its efforts to uncover evidence of early humans across the country. It is reanalysing old fossil finds and pouring tens of millions of dollars a year into excavations. And the government is setting up a US$1.1-million laboratory at the IVPP to extract and sequence ancient DNA. The investment comes at a time when palaeoanthropologists across the globe are starting to pay more attention to Asian fossils and how they relate to other early hominins — creatures that are more closely related to humans than to chimps. Finds in China and other parts of Asia have made it clear that a dazzling variety of Homo species once roamed the continent. And they are challenging conventional ideas about the evolutionary history of humanity. In its typical form, the story of Homo sapiens starts in Africa. The exact details vary from one telling to another, but the key characters and events generally remain the same. And the title is always ‘Out of Africa’. In this standard view of human evolution, H. erectus first evolved there more than 2 million years ago (see ‘Two routes for human evolution’). Then, some time before 600,000 years ago, it gave rise to a new species: Homo heidelbergensis, the oldest remains of which have been found in Ethiopia. About 400,000 years ago, some members of H. heidelbergensis left Africa and split into two branches: one ventured into the Middle East and Europe, where it evolved into Neanderthals; the other went east, where members became Denisovans — a group first discovered in Siberia in 2010. The remaining population of H. heidelbergensis in Africa eventually evolved into our own species,H. sapiens, about 200,000 years ago. Then these early humans expanded their range to Eurasia 60,000 years ago, where they replaced local hominins with a minuscule amount of interbreeding. A hallmark of H. heidelbergensis — the potential common ancestor of Neanderthals, Denisovans and modern humans — is that individuals have a mixture of primitive and modern features. Like more archaic lineages, H. heidelbergensis has a massive brow ridge and no chin. But it also resembles H. sapiens, with its smaller teeth and bigger braincase. 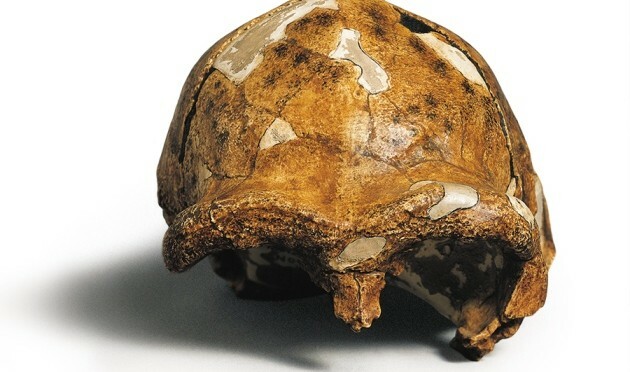 Most researchers have viewed H. heidelbergensis — or something similar — as a transitional form between H. erectus and H. sapiens. The tale is further muddled by Chinese fossils analysed over the past four decades, which cast doubt over the linear progression from African H. erectus to modern humans. They show that, between roughly 900,000 and 125,000 years ago, east Asia was teeming with hominins endowed with features that would place them somewhere betweenH. erectus and H. sapiens, says Wu (see ‘Ancient human sites’). The fossils’ transitional characteristics have prompted researchers such as Stringer to lump them with H. heidelbergensis. 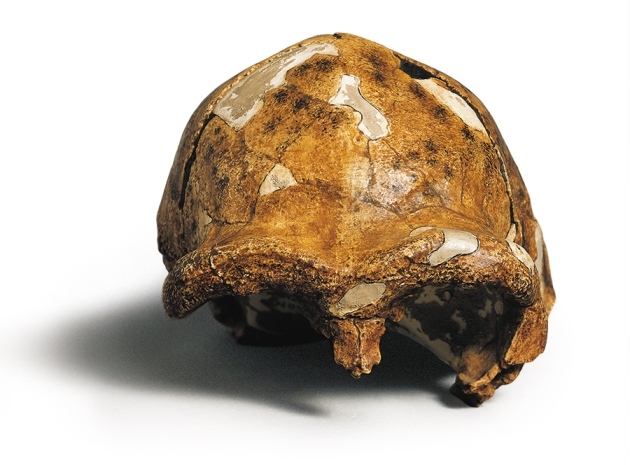 Because the oldest of these forms, two skulls uncovered in Yunxian in Hubei province, date back 900,000 years1, 2, Stringer even suggests that H. heidelbergensis might have originated in Asia and then spread to other continents. But many researchers, including most Chinese palaeontologists, contend that the materials from China are different from European and African H. heidelbergensis fossils, despite some apparent similarities. One nearly complete skull unearthed at Dali in Shaanxi province and dated to 250,000 years ago, has a bigger braincase, a shorter face and a lower cheekbone than most H. heidelbergensis specimens3, suggesting that the species was more advanced. Such transitional forms persisted for hundreds of thousands of years in China, until species appeared with such modern traits that some researchers have classified them as H. sapiens. One of the most recent of these is represented by two teeth and a lower jawbone, dating to about 100,000 years ago, unearthed in 2007 by IVPP palaeoanthropologist Liu Wu and his colleagues4. Discovered in Zhirendong, a cave in Guangxi province, the jaw has a classic modern-human appearance, but retains some archaic features of Peking Man, such as a more robust build and a less-protruding chin. Most Chinese palaeontologists — and a few ardent supporters from the West — think that the transitional fossils are evidence that Peking Man was an ancestor of modern Asian people. 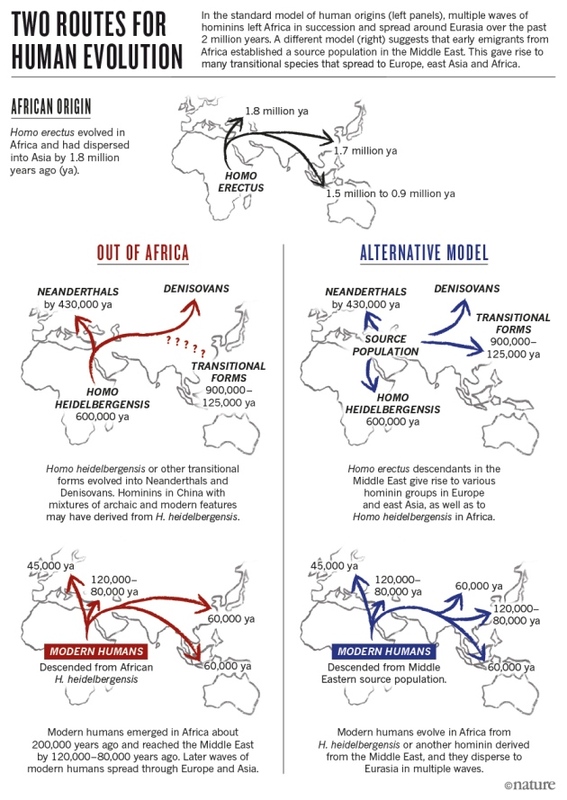 In this model, known as multiregionalism or continuity with hybridization, hominins descended from H. erectus in Asia interbred with incoming groups from Africa and other parts of Eurasia, and their progeny gave rise to the ancestors of modern east Asians, says Wu. Support for this idea also comes from artefacts in China. In Europe and Africa, stone tools changed markedly over time, but hominins in China used the same type of simple stone instruments from about 1.7 million years ago to 10,000 years ago. According to Gao Xing, an archaeologist at the IVPP, this suggests that local hominins evolved continuously, with little influence from outside populations. But the continuity-with-hybridization model is countered by overwhelming genetic data that point to Africa as the wellspring of modern humans. Studies of Chinese populations show that 97.4% of their genetic make-up is from ancestral modern humans from Africa, with the rest coming from extinct forms such as Neanderthals and Denisovans5. 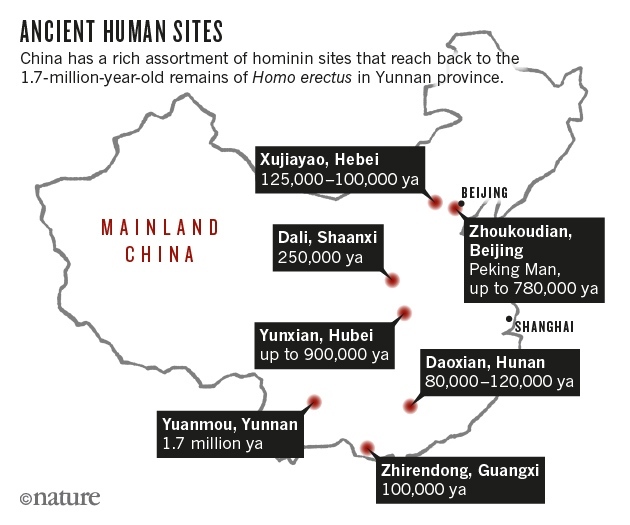 “If there had been significant contributions from Chinese H. erectus, they would show up in the genetic data,” says Li Hui, a population geneticist at Fudan University in Shanghai. Wu counters that the genetic contribution from archaic hominins in China could have been missed because no DNA has yet been recovered from them. Many researchers say that there are ways to explain the existing Asian fossils without resorting to continuity with hybridization. The Zhirendong hominins, for instance, could represent an exodus of early modern humans from Africa between 120,000 and 80,000 years ago. Instead of remaining in the Levant in the Middle East, as was thought previously, these people could have expanded into east Asia, says Michael Petraglia, an archaeologist at the University of Oxford, UK. 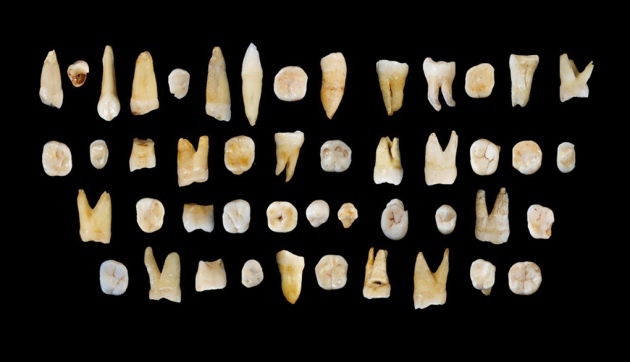 Other evidence backs up this hypothesis: excavations at a cave in Daoxian in China’s Hunan province have yielded 47 fossil teeth so modern-looking that they could have come from the mouths of people today. But the fossils are at least 80,000 years old, and perhaps 120,000 years old, Liu and his colleagues reported last year6. “Those early migrants may have interbred with archaic populations along the way or in Asia, which could explain Zhirendong people’s primitive traits,” says Petraglia. Dozens of teeth from a cave in Daoxian, China, have been attributed to modern humans and date to 120,000–80,000 years ago. Another possibility is that some of the Chinese fossils, including the Dali skull, represent the mysterious Denisovans, a species identified from Siberian fossils that are more than 40,000 years old. Palaeontologists don’t know what the Denisovans looked like, but studies of DNA recovered from their teeth and bones indicate that this ancient population contributed to the genomes of modern humans, especially Australian Aborigines, Papua New Guineans and Polynesians — suggesting that Denisovans might have roamed Asia. María Martinón-Torres, a palaeoanthropologist at University College London, is among those who proposed that some of the Chinese hominins were Denisovans. She worked with IVPP researchers on an analysis7, published last year, of a fossil assemblage uncovered at Xujiayao in Hebei province — including partial jaws and nine teeth dated to 125,000–100,000 years ago. The molar teeth are massive, with very robust roots and complex grooves, reminiscent of those from Denisovans, she says. A third idea is even more radical. It emerged when Martinón-Torres and her colleagues compared more than 5,000 fossil teeth from around the world: the team found that Eurasian specimens are more similar to each other than to African ones8. That work and more recent interpretations of fossil skulls suggest that Eurasian hominins evolved separately from African ones for a long stretch of time. The researchers propose that the first hominins that left Africa 1.8 million years ago were the eventual source of modern humans. Their descendants mostly settled in the Middle East, where the climate was favourable, and then produced waves of transitional hominins that spread elsewhere. One Eurasian group went to Indonesia, another gave rise to Neanderthals and Denisovans, and a third ventured back into Africa and evolved into H. sapiens, which later spread throughout the world. In this model, modern humans evolved in Africa, but their immediate ancestor originated in the Middle East. Not everybody is convinced. “Fossil interpretations are notoriously problematic,” says Svante Pääbo, a palaeogeneticist at the Max Planck Institute for Evolutionary Anthropology in Leipzig, Germany. But DNA from Eurasian fossils dating to the start of the human race could help to reveal which story — or combination — is correct. China is now making a push in that direction. Qiaomei Fu, a palaeogeneticist who did her PhD with Pääbo, returned home last year to establish a lab to extract and sequence ancient DNA at the IVPP. One of her immediate goals is to see whether some of the Chinese fossils belong to the mysterious Denisovan group. The prominent molar teeth from Xujiayao will be an early target. “I think we have a prime suspect here,” she says. Despite the different interpretations of the Chinese fossil record, everybody agrees that the evolutionary tale in Asia is much more interesting than people appreciated before. But the details remain fuzzy, because so few researchers have excavated in Asia. When they have, the results have been startling. In 2003, a dig on Flores island in Indonesia turned up a diminutive hominin9, which researchersnamed Homo floresiensis and dubbed the hobbit. With its odd assortment of features, the creature still provokes debate about whether it is a dwarfed form of H. erectus or some more primitive lineage that made it all the way from Africa to southeast Asia and lived until as recently as 60,000 years ago. Last month, more surprises emerged from Flores, where researchers found the remains of a hobbit-like hominin in rocks about 700,000 years old10. Recovering more fossils from all parts of Asia will clearly help to fill in the gaps. Many palaeoanthropologists also call for better access to existing materials. Most Chinese fossils — including some of the finest specimens, such as the Yunxian and Dali skulls — are accessible only to a handful of Chinese palaeontologists and their collaborators. “To make them available for general studies, with replicas or CT scans, would be fantastic,” says Stringer. Moreover, fossil sites should be dated much more rigorously, preferably by multiple methods, researchers say. More than a decade ago, researchers in a limestone cave on the Indonesian island of Flores unearthed the bones of an ancient race of tiny humans. Now, in sandstone laid down by a stream 700,000 years ago, they have found what appear to be the creatures’ ancestors. The new fossils are not extensive. A partial lower jaw and six teeth, belonging to at least one adult and two children, are all researchers have. But the importance of the remains outweighs their number. They suggest that dwarf humans roamed the island – hunting pygmy elephants and fending off komodo dragons – for more than half a million years. The first bones belonging to the miniature humans were dug from the floor of the Liang Bua cave on Flores in 2004. The 50,000-year-old fossils pointed to a now-extinct group of humans that stood only a metre tall. 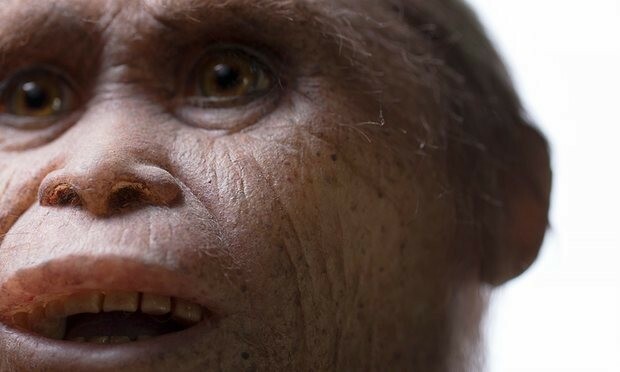 Named Homo floresiensis, but swiftly nicknamed the “hobbits”, they made simple stone tools and had desperately small brains, one third the size of ours. For all that was known about the diminutive humans, countless questions remained. How the species arose was anyone’s guess. Meanwhile, some experts argued they were not a new species at all, simply modern humans whose growth had been stunted by disease. The origins of the species known as ‘the hobbit’ – a human relative only a little over a metre tall – have been debated ever since its discovery in 2004. New fossils may reveal the ancestors of this strange species and help us to understand its history. But the fossils, described in two papers in Nature, lend weight to another explanation already favoured by some paleontologists. In this scenario, a founder population of Homo erectus, a forerunner of modern humans, washed up on Flores from a neighbouring island, perhaps clinging to plant debris uprooted by powerful tsunamis that crash through the region. Marooned on Flores with limited food at hand, evolution favoured the small. Over 300,000 years, the new arrivals rapidly lost stature. The team from Australia, Indonesia and Japan worked with 140 locals on Flores to excavate the fossils. The jawbone is tiny, at least 20% smaller than that of the Liang Bua “hobbits”, but CT scans showed the wisdom tooth had erupted, a sign that it came from an adult. The shape of the jawbone resembles a smaller version of that found in Homo erectus, as does a molar tooth. Simple stone tools, mostly sharp-edged flakes, were also found at the site, though no signs of butchery have been spotted on the animal bones. Curiously, the tools at Mata Menge are similar to those found at the Liang Bua cave, but simpler and smaller than others found at an older site on the island called Wolo Sege. These heftier, more advanced implements, including carefully shaped core tools known as picks, may be the million-year-old work of the island’s large-bodied founding population, said Brumm, a technology later lost as the dwarfing process took its toll in the islanders’ brains. Taking measurements for the archaeo-magnetic survey in the Bruniquel Cave. Credit: Etienne Fabre-SSAC. Neanderthals are generally viewed as humanity’s poor relation, whose lack of social cooperation and poor intellect placed them on the path to extinction, while homo sapiens flourished. But an astonishing new discovery suggests that they were once far more developed than our own species. 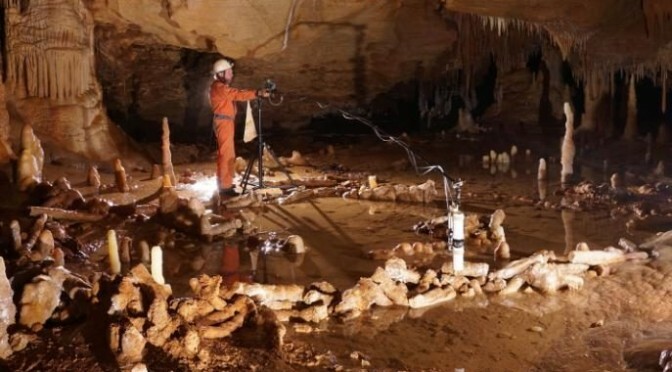 The first ever man-made structures have been found by archaeologists excavating caves in southwestern France dating from 176,500 years ago. And it appears they were constructed by Neanderthals. The strange circular enclosures were built using stalagmites and stalactites, with chunks snapped from the cave roof and floor to form walls, in a similar way to how dry-stone walls are built today, with smaller pieces filling the gaps. They rose 15 inches in height and were 20ft wide. Crucially, the small circular fences were found more than 1,000 feet from the cave entrance, down winding tunnels, where no daylight could have reached, meaning the builders must have already been using fire for illumination. “Their presence away from the entrance of the cave indicates that humans from this period had already mastered the underground environment, which can be considered a major step in human modernity,” said Jacques Jaubert from France’s Bordeaux University. “Neanderthals were inventive, creative, subtle and complex. They were not mere brutes focused on chipping away at flint tools or killing bison for food. “What surprises us most is the ability of Neanderthals to have explored very deep into caves far from natural light. A 3D reconstruction of the structures in the Bruniquel Cave. Credit: Xavier Muth- get in situ,Archeotransfert, archeovision-SS-3D, Base photographique Pascal Mora. The cave’s 400 stalagmite rings have been named ‘speleofacts’- literally meaning ‘cave structures.’ Many of the enclosures had been burned suggesting they had been set alight, perhaps for ritual purposes or used as early hearths for light and heat underground. Most evidence of cave-dwelling and early ritual behaviour comes from paintings at sites like Chauvet and Lascaux in France and Altamira in Spain but they all date from under 40,000 years ago, which is when modern humans first appear. But the speleofact creators must have been Neanderthals who were not thought to have ventured far underground, nor to have mastered such sophisticated use of lighting and fire. It is known that great apes, birds and other animals are capable of construction elaborate nests and the archaeological record contains examples of constructions made by anatomically modern humans about 20,000 years ago, such as collapsed, rounded ‘ruins’ made from mammoth bones or deer antlers. But only a few post holes have ever been interpreted as Neanderthal, and even those were viewed as controversial by many archaeologists. 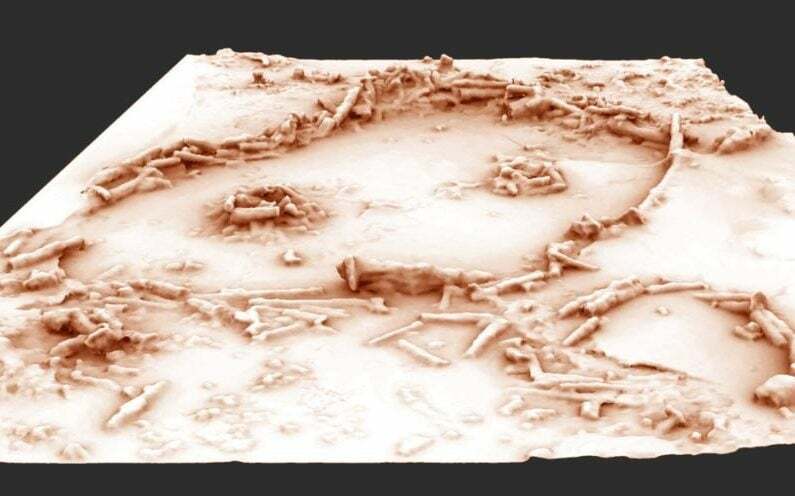 “Our results suggest that the Neanderthal group responsible for these constructions had a level of social organization that was more complex than previously thought for this hominid species,” added Dr Jaubert. 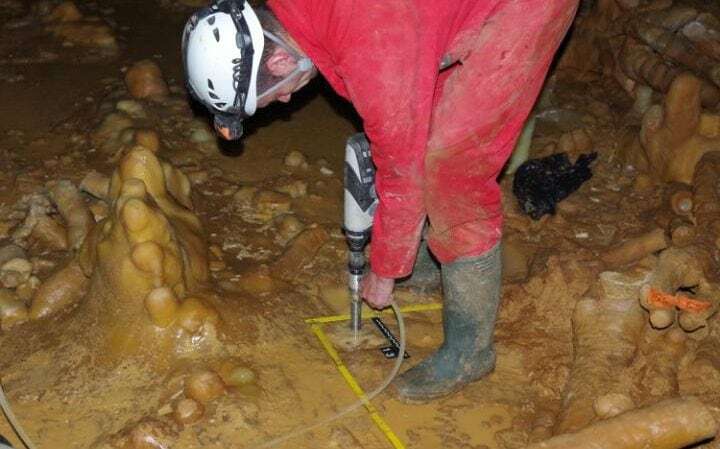 Drilling into the stalagmitic floor inside one of the structures in the Bruniquel Cave. Credit: Michel Soulier-SSAC. Neanderthals lived in Eurasia from around 400,000 to 40,000 years ago, at which point anatomically modern humans moved in and took over, out-competing the native tribes. They were preserved so well because the calcification that allowed the stalagmites and ‘tites to form in the first place then covered the rings. Archaeologists believe that other structures might have existed, but have not survived. “These structures are among the best-preserved constructions known for the whole of the Pleistocene Epoch probably because they were sealed by calcite very soon after they were erected,” said Marie Soressi, an archaeologist at the Leiden University in the Netherlands, writing in an editorial in the journal Nature where the findings were published. “When the best evidence is found in the best-preserved context, it serves as a reminder for archaeologists of how much we depend on preservation. The relationship between early human groups was incredibly complicated. You’ve probably heard the story about how Neanderthals were living in Europe for hundreds of thousands of years, when suddenly a bunch of Homo sapiens came pouring out of Africa about 70 thousand years ago. Thirty thousand years later, pretty much all the Neanderthals were dead. Many anthropologists believe that Homo sapiens killed off our large-browed cousins in a quest to dominate the Eurasian continent. But over the past 10 years, that view has changed radically thanks to new techniques for sequencing ancient DNA. Now, two new studies make it even less likely that modern humans killed off the Neanderthals. Instead, we interbred with them at least three separate times, and our ancestors were likely sharing tools with them half a million years ago. Writing in Nature, a team of scientists recount how they carefully sequenced the DNA from a mysterious group of 430-thousand-year-old humans found in Sima de los Huesos, a cavern in Spain’s Atapuerca mountains. Thanks to careful preservation of the remains, they were able to extract both mitochondrial and nuclear DNA, allowing them to analyze genetic contributions from the group’s mothers and fathers. What they discovered has upended the classic story of how Neanderthals got to Europe, and when. The Sima hominins are clearly early Neanderthals, living in Spain far earlier than expected. Paleolithic sexytimes reveal that Homo sapiens made it out of Africa earlier than we thought. Previously, scientists believed the last common ancestor of Neanderthals and modern humans was Homo heidelbergensis, an early human who lived about 700 to 200 thousand years ago. But the Sima hominins reveal that humans and Neanderthals must have diverged between 550 thousand and 765 thousand years ago, a timeframe that eliminates H. heidelbergensis as a possible progenitor. Paleoanthropologist Maria Martinón-Torres told Nature News that the common ancestor of Neanderthals and modern humans probably lived about 900 to 700 thousand years ago. One possibility is Homo antecessor, whose 900-thousand-year-old remains have been found in Spain. Making things more confusing, the Sima humans have mitochondrial DNA that appears to be from Denisovans, another group of early humans that settled in Europe hundreds of thousands of years before modern humans did. Writing in Nature News, Ewan Callaway explains that Matthias Meyer, an author on the new study, “now favors the hypothesis that an as yet unknown species from Africa migrated to Eurasia and bred with Neanderthals, replacing the mitochondrial DNA lineages. (Supporting this idea, stone-tool technologies spread from Africa to Eurasia around half a million years ago, and again 250,000 years ago).” In other words, these early humans leaving Africa weren’t killing Neanderthals; they were sharing tools and families with them. Even tiny groups of humans would have had the tech to out-compete Neanderthals. Meyer’s findings fit nicely with other recent studies, which show that even when modern humans left Africa, they weren’t killing their distant human cousins. Instead, they had children with Neanderthals and Denisovans, in several distinct events. If the meeting between humans and Neanderthals had been genocidal, it’s unlikely we would see patterns that show Neanderthal and Denisovan DNA enter the modern human genome multiple times. A paper that has just come out in Science explains how modern human DNA contains clear evidence that our ancestors got busy with Neanderthals and Denisovans at least three different times in the past 100 thousand years. Collectively, these data suggest Neanderthal admixture occurred at least three distinct times in modern human history. Although most South Asian populations show shared histories of archaic admixture, we find significant evidence of differential Neanderthal admixture between some European and East Asian populations. In other words, modern humans didn’t sweep out of Africa, killing everything in their paths. They settled down with the locals, many different times. Evolutionary biologist Carles Laleuza-Fox, who was not involved in the study, told The New York Times’ Carl Zimmer, “This is yet another genetic nail in the coffin of our over-simplistic models of human evolution.” These papers also testify to how long different groups of humans have been intermingling, sharing ideas and hearths. Even though humans are notorious for hating and killing strangers, there’s no denying that migration is written into our DNA, as well as a history of embracing people who are different.